Made of aluminum with good thermal conductivity. We used hard aluminum excellent in corrosion resistance and abrasion resistance. These are aluminum products that can be used for a long time under harsh conditions, and be washed thoroughly by scrubbing. ※ Please check the catalogs for details. 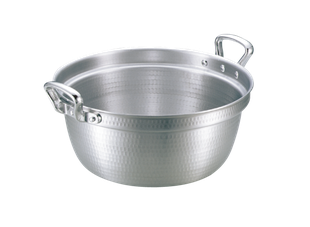 Stock pot which is familiar with professional chefs. Lightness in large size is Unique to aluminum. It also boils water quickly and is good for boiling food too. 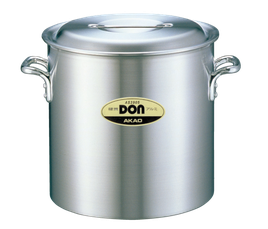 Widely used in home cooking to professional cooking. We have two type spouts, standard and Crow's beak, with which it’s easier to pour liquid. Mainly for egg dishes such as oyakodon or katsudon. 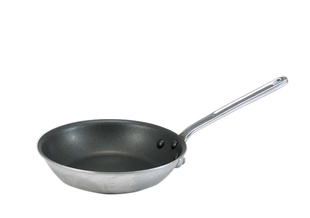 With special lid, you can cook your egg softly. You can choose 2 types of handles. 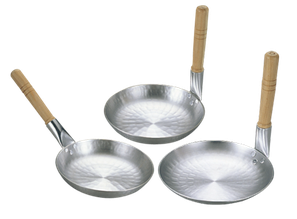 Our frying pans have been loved in professionals over 30years. All aluminum materials including handles. It is easy to emulsify (Oil and water intermingle) and Ideal for pasta etc. 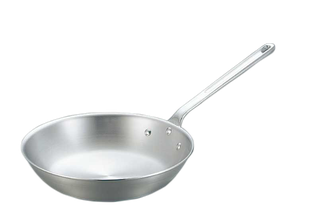 Products which are made by applying fluorine coating to aluminum frying pan. Leaving lightness and thermal conductivity as it is, we resolve the cooking stains formed by burning. 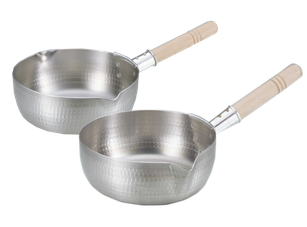 You can use professional cooking wares at home!